How to identify: Leaves often compound and pinnate or trifoliate (but there are exceptions like Alysicarpus, some Crotalaria, Hovea, Pultenaea etc, which has single leaves). Stipules usually present (especially for the herbaceous or climbing species, but not always as obvious in the trees). In the compound-leaved trees and the stouter vines I find that the leaflet stalks are somewhat thickened or ‘stoutish’ with transverse wrinkles. 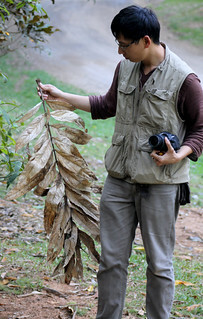 The pinnate leaved species usually have opposite leaflets and a terminal leaflet with a longer stalk. This family now includes all the other legume families Caesalpinaceae and Mimosaceae (wattles and such).